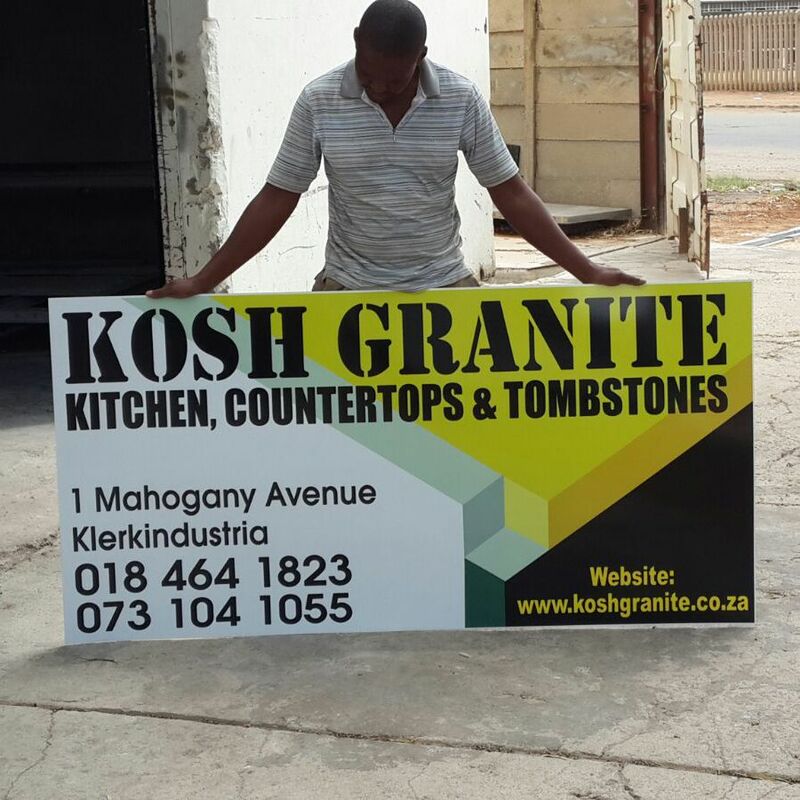 KOSH Granite has been in the granite business since 1997 and is producing counter tops, vanity tops, fireplace cladding, windowsills and beautiful granite tombstones. Since 2016 we also provide comprehensive carpentry services for all your modern kitchens/ bathrooms and bedroom cupboard needs. Our customers include but not limited to: Checkers; Food Lovers Market; Courier Guy; Montague; Wilmed Hospital; Klerksdorp Hospital; Handy House, Ricoh/Consensus; Klerksdorp High School, PapaJoes and including many private home and business owners around South Africa. The business is family owned with a hand on management approach. Customize and standard products are being manufactured to suit client needs. Every order is being treated with respect and we endeavor to deliver on time and the best possible quality. Durability and excellence in every single installation is of the utmost Importance and we will lean backwards to accommodate every request. We have an excellent track record and well qualified artisans with a cumulative working experience of close to 50 years. Proof of the service we deliver are the testimony of many clients that keep on coming back over many years. Areas of delivery include North West, Free State, Gauteng, Northern Cape, Lesotho , Mpumalanga and Eastern Cape. As a service driven business we deliver quality products, on time, every time! Providing a friendly and competitive service is our game. Over 3000 tombstones and 2500 kitchens and counter tops produced thus far we pride ourselves in constantly bringing better service and better products to you our customers. Our service level is what sets us apart from our competitors! Almost celebrating our 20th year in business and still growing year-on-year. We pride ourselves in service delivery to our customers, therefore we will meet you on site, measure and discuss design options, material options, and have your quote ready between 1-24 hours of measuring. We always react immediately by trying to meet every client the exact same day that the inquiry has been made ensuring there is no delay in the process. Our factory’s office is also client friendly and we welcome visitors to come sit and discuss requirements. Tombstones can be chosen from a catalgue or you may bring your own design or photo. Kitchen cupboards are designed in 3D or a counter top can simple be chosen from our extensive sample range. We’ll guide you through the process. We pride ourselves in giving you the best price available for your project. Each clients needs are individually assessed and every quote is optimized to give you the customer the best possible price and experience. Your quote is done without any hidden costs. What you see is what you pay! The same people who guides you through the consultation process ensures that measurements are done correctly; installations happen timeosly and that the quality is checked throughout the projects lifespan. Once you deal with us we know you will stay with us. No jumping between designers and others service providers. We handle all for you! Part of our professional management policy is to constantly engage you the customer to ensure the project is going to your liking and ultimately is signed off as you expected. We pride ourselves to be on time, everytime, from start to finish.. We deal with suppliers and on occasion material may have to be sent back or replaced. Thus we always ensure to keep our clients updated with any new changes in the schedule. KOSH Granite specializes in design/crafting and installation of elegant Home/Business counter tops of all Engineered Stone, Granite & Marble as well as beautiful Tombstones.